Greg Mercer: What’s up guys? 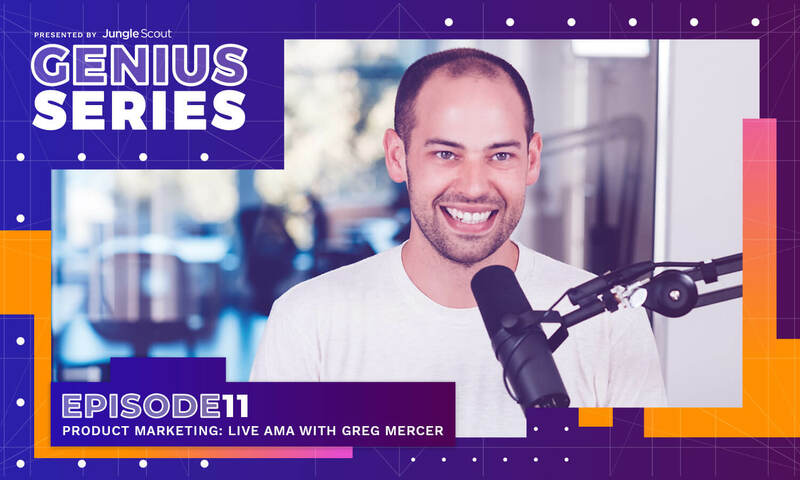 We are live for today’s AMA session on the Genius Series, where we are talking all things related to Amazon marketing. So let me know what questions you guys have for me. Drop them in the chat box, wherever you’re tuning in from and I’ll be more than happy to answer anything I can over the next 30 minutes. I would like to say the AMA’s focus today is on Amazon marketing. So I’m gonna prefer questions related to that. However, if there’s time I’ll try to sneak in some other questions you guys have as well. Real quick while we’re waiting for a few of the questions to pile into the chat box, I have two announcements. One, a lot of you guys might’ve heard by now, but we are launching a new marketplace called the Jungle Market. The Jungle Market’s a place where you can find pre-vetted Amazon service providers to provide services for you, the Amazon sellers. So these will be things like photography, copywriting, logo design, package design, you name it, there are service providers on the Jungle Market to hook you guys up with these. Right now if you go to junglemarket.com, there is a coming soon page. However, we are in beta so I am gonna tell you guys a little bit of a secret link so you can access it and find things on there if you would. So if you got app, so app.junglemarket.com, you can find all the listings that are on there and you can get beta access to the Jungle Market. So check it out. Is there a formula to estimate how much you would spend in PPC for your first order? All right. Yes. So if we look at … So the number I use is 5% of total revenue spent on PPC and if we look at for instance like my Jungle Stix, I think we did the math and it was like four or four and a half percent of total revenue is spent on PPC. Now just to clarify real quick, that does not mean that my ACoS, or advertising cost of sale is 4%, those are much higher. However, keep in mind that not all of my sales come from PPC, a lot of the sales come organically. So a whole, I think if you wanna budget like roughly 5%, I think that’s a good ballpark for you. Do I need PPC to get more sales and if yes, how to start taking into account that my product leads on the first page? All right. Let’s see a few other questions here. “I have a product that runs three months and make … I have a product that’s been running for three months and makes and average of three units per day without PPC campaigning and it has six reviews. This product is located, one on the first page where [inaudible 00:02:47] sponsored products, the price is around $35.00, has a well built product page. My question is whether I need PPC to get more sales and if yes, how to start taking into account that my product lead’s on the first page?” All right. So it sounds like to me you’re having … you’re getting three units per day, you’re ranked number on one the first page for what you believe is like your main keyword. So actually I would say like in that scenario, it’s probably more likely that there’s just not that much overall demand for your product. PPC might improve the sales a little bit, but if you’re ranked in the first spot on the first page for your main keyword, being above that for the PPC spot’s probably not gonna get you that many additional sales, maybe a few ’cause you’re taking up a little more real estate on that page. The one thing that I’d say that would be beneficial for you regarding PPC is the fact that you could probably try to target more keywords. So even though you’re on the first page, the number one spot for your main keyword, people are of course searching for other keywords for this as well. Why not create your own eCommerce store and spend all your energy on something that you have that is yours and have full control? All right. Here’s another question from [Jav 00:03:57]. He said, “Just wondering, since you’re spending the time and money of doing this to sell on Amazon platform, why not just create your own eCommerce store and spend all your energy on something that you have that is yours and have full control? At the end, that’s why you’re trying to do with the power of Amazon, right?” Yeah, it’s a good question. So building your own platform and getting traffic to go there and purchase it is very difficult to do. It’s much harder than launching an Amazon product. Okay. So typically, the people that we work with and I communicate with, very few people are able to successfully build their own eCommerce store, drive traffic to it profitably and get people to purchase on there ’cause you have to understand that … I think a lot of people think like if you build it, they will come. Like if I build this Shopify store, it’s magically gonna have traffic and the reality of it is it’s difficult to get traffic to these sites. You need to run paid ads, which are difficult for a lot of people to do and typically very expensive or you need to be creating content and driving traffic to that content, or getting it ranked in Google or I mean there’s different ways to acquire traffic. But all these take quite a bit of either technical experience or like time and energy, which on Amazon, the shoppers are already there and they’re already shopping. So if you want, you could try to build your own eCommerce platform. I’m just … To be upfront with you and transparent, very few people are able to do so successfully, just because you have to have like so many different kinda like levels of experience to get the traffic to the site. How can I use Jump Send? Joel said, “Just getting ready to launch my first product this Friday. How can I use Jump Send?” Congratulations, that’s very exciting. Only two days away to launching your product. As far as using Jump Send, jumpsend.com to sign up for it. Jump Send is a deal’s site as well as an email automation platform. So Jump Send’s a place for … Very inexpensively you can distribute coupons to shoppers. The shopper’s use your coupons, which increases your sales velocity. In return, you’re gonna rank better for your keywords and as a result of that, you’re gonna get more reviews as well. What do you recommend: AMS or PPC? Louis said, “What do you recommend, AMS or PPC?” And by PPC, I assume he means the Amazon sponsored products platform. AMS pretty much has no benefit anymore because you can run headline search ads inside of Amazon Sellers Central. So the short answer there Louis, is just use PPC inside Amazon Sellers Central. All right. Are influencers in the Jungle Market? Influencers is not one of the categories we have on the Jungle Market right now. However, that might be something we add in the future. We wanna … As you grow a market place, there’s two sides, there’s supply and the demand. Right? So we started with just a few different categories to build up the supply and the service providers in those particular niches, and then as we grow, maybe we’ll add influencers. That’s a good idea. Related: Looking for help with your Amazon business? Learn how we’ve created the perfect tool for you. Do you need an email list for your FBA business? No, you don’t need to have an email list for your FBA business. If you want to try to build one, as far as building one from selling FBA products, what I would recommend is … It seems like what people have the most success with is dropping little insert cards inside of their packaging, saying something like, “Register for the warranty.” Or, “Register here to get a coupon for future products.”, or whatever else you wanna do. Then send them to a landing page where you’re collecting the email. These email lists in my experience are relatively low impact and aren’t super valuable, but if that’s really important to you, then feel free to do so. What is the current net profit for Jungle Stix? Alan said, “Hey, what’s your current net profit for Jungle Stix?” I think all things considered, once we factor in PPC and all the shipping costs and storage costs and fees and everything else, I think it’s running around 20 to 25%. So on every sale, they sell for about 20 to $22.00, we’re making … we’ll just call it roughly five bucks. Related: So how’s Jungle Stix doing, anyways? Do you need review before running PPC? No, it’s fine. You can go ahead and run PPC without having any reviews. Typically, once you get like 10 or 20 reviews, you’ll see your PPC converts better. However, in the mean time … I mean you have to make sales to start ranking well and in return getting more organic sales. So yeah, I personally just go ahead and turn on PPC day one. Related: How to use Amazon PPC. Can I use affiliate links on my own products? My understanding of this, which I believe is correct but don’t quote me on it, is that it is breaking the terms of service of the Amazon affiliate program. All that being said, what people tell me … I haven’t done this, is that is a totally separate program. Sometimes their accounts do get like banned, but that’s like their Amazon affiliate account, which they … Typically, people don’t really care that much about, which is totally separate from you Seller Central account. So I think the short answer to your question is it is not allowed per Amazon’s terms of service. There seems to be some debate about this but that’s my belief. However, you’re not putting your Seller Central account at risk, just your Amazon affiliate account. Related: Amazon affiliate marketing: how does it work? In the Jungle Scout web app, is there a way to default exclude sponsored ads or a button to remove them all at once? In the Jungle Scout web app … it’s showing you all of the products. It doesn’t matter whether they’re running … if they’re running PPC, Amazon sponsored products or not. So you don’t really need to remove them. Related: Find a profitable product in 20 minutes or less with this cool tool. Good question. Deon, at some point you just have to make a decision and I think just … I think this helps a lot of people, just understand that you know what? The … Like whatever the first product you choose, like just expect to break even. Don’t even expect to make money on it and that way … and just know that like by launching that though, it’s a tremendous learning opportunity. You’re gonna learn so much and you know what? Maybe it’ll do well, maybe it won’t and you’ll kinda just get your money back or roughly break even. But you’ll learn so much from that, that the second time you should be able to be successful with it. So I think at some point, you just have to make that jump and just go for it. Related: 10,000 profitable product ideas (free download). What are your thoughts regarding Merch by Amazon? I don’t have any personal experience with Merch by Amazon. What I understand from talking with other people is in the early days, it was quite easy to make money off of it. Now they’re very strict about designs and I don’t hear about very many people being successful with it. Related: How much money do you need to start selling on Amazon? Can you compete on Amazon despite 35% fees? I don’t really agree. So I mean keep in mind … Like 35% is like a good rough estimate for considering all your fulfillment and your commissions and whatever else. But there’s hundreds of thousands or millions of sellers that compete really well and they’re all … have to pay these same fees. So … And also like if you’re talking about competing against Amazon, for one they have a very limited product category. So there’s a lot of types of products that they don’t even sell and number two, I mean they still have fees associated with them personally having to fulfill these items, driving traffic to their site, all those types of things. So yeah, I wouldn’t really worry about that. Related: Is Amazon too competitive? Get Greg’s thoughts on this and a number of other topics. How do you get reviews without violating Amazon TOS? I would … So Patrick, it sounds like you understand this but in order to get ranked well, you need sales. In order to get reviews, you need sales. So it’s like at the beginning, you have to just kind of like force sales on your product. Right? So what I do … The easiest way to do it is through PPC spend. It sounds like you need to be more aggressive on your PPC, maybe it takes more keywords or your bids need to be higher or you will be able to get sales through PPC. The other thing I do is give away coupons. So you can use a platform like Jump Send. Jump Send works in the UK and there’s shoppers on there in the UK that will request your coupon. They’ll then buy your product on Amazon with that coupon, as a result you’ll get sales. When you get sales you’ll rank better, which you get more organic sales and any time you make sales, a certain percentage of those are gonna lead to reviews. So I mean that’s the way that you just have to get these products started. Related: Get product and seller reviews using Jump Send. Other than PPC, what can I do to get more sales? So I would do a few things. For one, I would be asking myself A, is there good demand in this particular niche, hopefully there is. B, do you have a strong listing, are your photos good, are you ranking for all your main keywords, all those types of things. Then after I’ve kind of verified that, that’s when I’d be more aggressive with giveaways or PPC. You say PPC hasn’t really worked, but to me it sounds like there’s probably some optimization you can do there. So on a product like this that it’s steady but sales are slow, you essentially just need to be more aggressive, which is like trying to launch it again because if you’re stuck on page like four for your keywords, you’re never really making sales. Right? So that’s why … like when that happens with all of my products, I’m just more aggressive and like giving away a whole bunch more coupons or being really aggressive on PPC. Then all of a sudden, I start ranking … like moving up the ranks better and then it overall is then selling better. Related: How to effectively optimize your Amazon PPC ads. How do you know when to give up on a failed product? Good question. So I mean 10 sales a day is good. I mean that’s sort of like … that’s my target for all the products that I launched, so you’re making a good number of sales. At this point it seems like you need to optimize your PPC and just kinda like overall try to optimize better for profits. So maybe that means raising your price a little bit. Can you raise your price another dollar or two or three and still make 10 sales a day? If so, it’s gonna help your margins a lot. How can you optimize your PPC? Can you … those words that … Your ACoS is very high, can you either reduce your bid or or kill that word altogether? So I wouldn’t say this is a failed product, but I’d say there’s just some room for optimization here. Your sales are good. At this point, we’re just … you just need to kinda optimize for profits. Related: Amazon horror story: failure to put a plan in place led to a total product disaster. Should I start two separate accounts for book selling and private label selling? No, I don’t think it’s necessary. I don’t think anyone … Nobody … Like no normal shopper like clicks on a seller’s storefront to also see if they’re selling books or anything else. Right? The shoppers don’t care. Most of the shoppers don’t even know that like … there’s third party sellers on Amazon. They all think they’re buying directly from Amazon. So it’s … That’s kind of like the first thing. If you do want a … seller account, you can email Amazon asking for that permission. Kind of … People have mixed results. Some people get approved for these pretty easily, some people don’t, but it’s not necessary in my opinion. Related: How to sell books on Amazon. How can a non-US citizen sell legally in the US? Can you suggest … So I don’t have any … I guess I’m like a U.S. citizen, so I only have experience at setting up a Amazon account being a U.S. citizen. From my understanding, it might be a little bit different depending on what country you kinda live in, but unfortunately, I don’t think I quite qualify to have the experience to help you with this. I’m sorry. Related: How to expand your Amazon business into new markets. Can you ask friends and family to buy your Amazon product to leave a review? Samuel Gomez says, “Can you ask your family and friends individually or on Facebook to purchase your product, hopefully for a good review without breaking Amazon’s terms of service? Do I have to unfriend them on Facebook?” All right. So … I mean you can anyone for a review. You can’t incentivize people to leave reviews, that means with like a discount or a free product or whatever else. I think there’s rumors going around that like Amazon has backdoor access to your Facebook and knows who your friends are and whatever else. I personally don’t believe that’s true. Yeah. I mean Samuel use your best judgment here. Personally, I always abide by all the terms of service because I like to be very careful with my Amazon seller account and I just overall believe it’s best for all sellers to be very ethical. So yeah. When should you start driving outside traffic to your Amazon products? Good question. I’d say like once … So I guess my opinion is that it’s never worth it. I think it’s a waste of time. A lot of people don’t agree with me there, but that’s my personal belief. I think if you spent the same amount of time just like launching new products and optimizing your products on Amazon, whatever else, you’d be better off and make more money and grow your business faster than trying to focus on all these outside marketing channels. That’s my personal opinion, like I said, a lot of people don’t agree with it, but that being said … So I mean if you launched your product and you feel like you wanna get some influencers to start promoting it and whatever else, then feel free to give it a try. Yeah, different people have different levels of success with it. Is there a way to 100% protect your product from hijackers? No, there’s no way to 100% protect that. Okay. Some things that you can do to minimize the chance of this happening is sell a product that is pretty unique or has pretty unique packaging so that it is difficult for someone to just sell a generic product without your branding under it, but … So that’s a good way to protect against like counterfeiters, but as far as just like ordering your product at a discount then reselling it under your listing, there’s no real way to protect against that, because like Amazon allows that. That’s how their market place is built, but I wouldn’t worry about it. Like yeah, from time to time, I find on different listings that someone’s like bought my product at a discount and selling it, but it’s not that big of a deal. Like okay, they took one sale away from me, like whatever. Like it still like improved the overall BSR of this listing in the overall ranking of this listing. So it’s like yeah, I made one less sale, but in the big scheme of things, in like the … Let’s say each of these products sell 5,000 a year. Is it a big deal that like three of those 5,000 were sold by someone else? No, like I don’t lose sleep over that and I don’t think you should either. Related: Protect your Amazon products with the Amazon brand registry. Can my product trademark just be my name/logo to get enhanced brand content? Yes. So you might be mixing up trademark and a patent. Trademark’s are easy to get and you get a trademark to protect your brand name. Okay. So like I have the trademark on Jungle Stix, so no one else can register the trademark under Jungle Stix and sell like kitchen utensils or cooking utensils or whatever else. Okay. And they’re easy to get and I think that’s what you’re asking, but it sounds like maybe you’re also confused like … confusing with a patent. But a patent protects like the overall design or like what a product is supposed to do, whereas a trademark protects your brand name essentially. Related: Trademarks for Amazon sellers: everything you need to know. Does Jump Send email companion send emails for sales even if they weren’t through a promotion? Yes, it does. Jump Send sends an email for everyone who purchases your product. It doesn’t matter if they used a coupon, it doesn’t if they … it’s a deal or it’s an organic sale or PPC sale or whatever else. They send emails to all these people, so yes. All right. Related: How to use Jump Send to reach out to your customers. How many sellers selling one product are too much when you are product researching? So this is a gauge. I prefer the number of reviews as a better gauge of like competitiveness, but I wouldn’t like … I don’t wanna see more than one page of results of everyone selling the same product. So I think that’s a good rule of thumb. If there’s like two pages of results and everyone has like pretty more or less the same product, then that’s pretty dang competitive. Related: Greg answers questions on product research. Is it always necessary to have your own packaging? No, it’s not always necessary to have your own packaging. I think a great thing to do for this is like just put a label on it. So the label would just have like your brand name, your FN’s skew and whatever else and that’s like enough to kinda like have it as your own brand. Related: Looking for packaging design? Why not hire a freelancer! Why is Amazon removing my product’s reviews? So Nathan, Amazon has a very sophisticated algorithm and way of detecting what they believe are not unbiased or … like influenced reviews or whatever else. So they believe that those four that they removed were people who were maybe related to you somehow or they were not … they were biased reviews. So somehow you influenced them to do so or whatever else. So yeah. So I mean if you’re being honest with yourself, a few of these reviews have probably been people that you’re friends with or whatever else and like I said, Amazon is very sophisticated at recognizing that, and that’s why they removed those reviews. Related: Amazon product launch strategies (our own case studies). All right guys. So that is it for today. I have one big announcement. We’ve been recording a podcast called Go Pitch Win. Go Pitch Win is a Shark Tank style podcast, where people are coming on to pitch their business or product ideas to myself and another judge. We’ve recorded a dozen episodes and the first episode goes live next Tuesday, April 10th. Each week we’ll be releasing three episodes. So there’s two episodes of entrepreneurs pitching their ideas and one episode announcing the winner. So stay tuned and be on the lookout for that or if you’re watching this in the future, go to iTunes or YouTube and search for Go Pitch Win and you can find the episodes. They were a total blast to record. Some of these business ideas are very awesome and it’s very fun to hear these people pitching these ideas, as well as myself and the other judge providing feedback on these business ideas. So stay tuned for Go Pitch Win. I announced it at the beginning of this AMA, but we launched the Jungle Market. A place to find pre-vetted Amazon specialists to provide services for your business. So right now if you go to junglemarket.com, it’s still in beta. However, if you go to app.junglemarket.com, you can actually get access to the closed beta group and start finding some of those services. Guys, if you liked this AMA, if you provide … if you found it useful, we’d love it if you give us the thumbs up on Facebook or YouTube or hit that subscribe button on YouTube, it’d be much appreciated, and it gets me stoked to come back and do more of these. So guys thank you very much for tuning in. It’s been a lot of fun. Best of luck with your Amazon businesses and I will see you later. Is this the last episode of the genius series? I love this episode of AMA! Do you offer private tutorials to beginners like myself? I am very interested in selling on Amazon but I’m not savvy with setting up, picking products, and everything else that’s required to get started. Once you put me through all these, I will be able to continue on my own. Please help!